Unbelievable 2 Night July Weekend Special! (19th & 20th). Won’t last long! Special Offer for Friday and Saturday (July 19th & 20th). Includes EVERYTHING (Cleaning, taxes etc). Email me for more details! ACTIVE / RETIRED MILITARY AND FIRST RESPONDERS DISCOUNTS! AARP and AAA Discounts as well! Ask us about FREE NIGHTS STAYS! 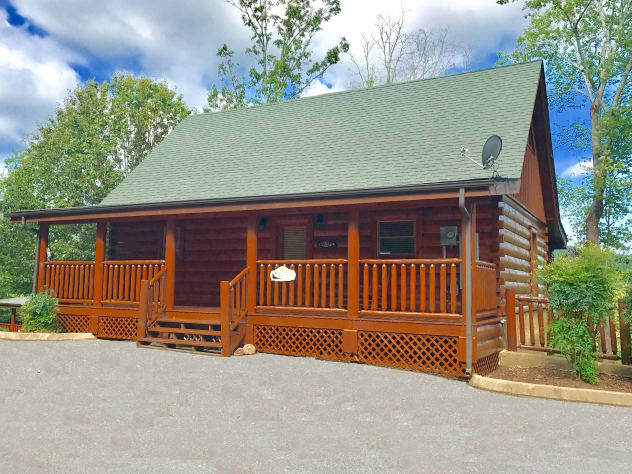 Bearly Behavin is a beautiful, 1-bedroom cabin located in Bear Creek Crossing, a gated community just minutes from downtown Pigeon Forge. 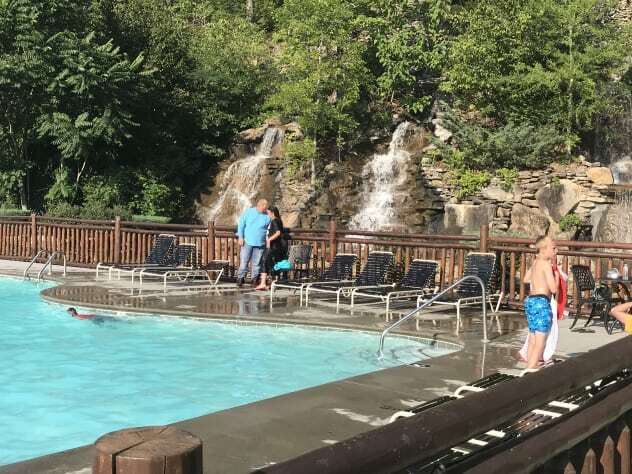 This resort community offers several amenities which includes a FREE onside putt putt course, an indoor pool for winter, and a relaxing outdoor pool during the summer with a triple waterfall backdrop. 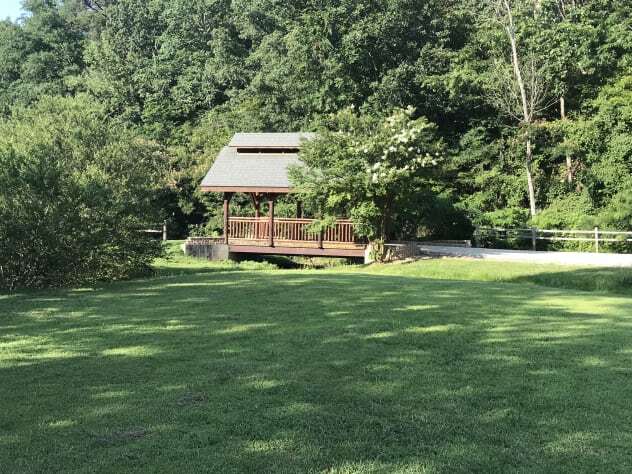 The area also includes a covered bridge pavilion, and large grassy areas perfect for outdoor activities. You can also use the on-site gym from 7 AM – 9 PM daily, or book the clubhouse for weddings, reunions, or meetings. 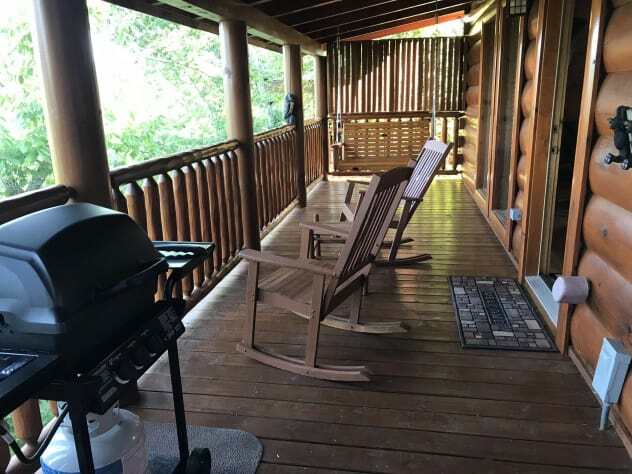 This cabin is located approximately 5 minutes from Pigeon Forge, 15 minutes from Dollywood & Splash Country, and about 20 minutes from downtown Gatlinburg. 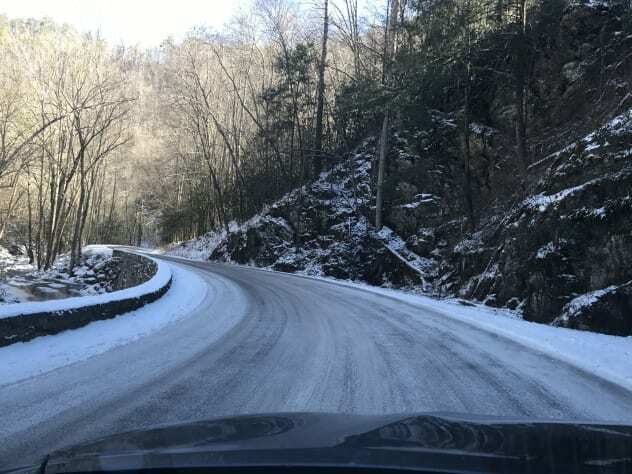 This community offers paved roads all the way up to the cabin, and although there are some slight inclines and curves, there are no prodigious uphill climbs. This cabin provides available parking for up to two four-wheel vehicles. 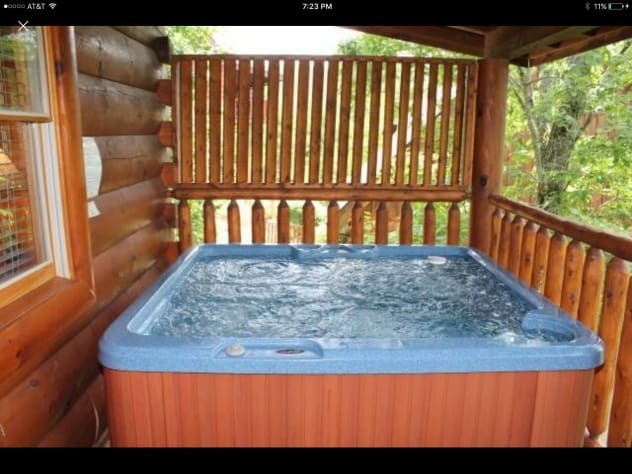 "Bearly Behavin" is a 2 level, 1 bedroom, 1.5 bath log cabin that sleeps up to 4 adults. The main floor offers a fully equipped kitchen, half bath, and living room with a huge coomfortable sofa and chair. A large 55" flat screen TV above the fireplace offers Direct TV which provides over 150 channels including ABC, NBC, CBS, Disney, HGTV, History, CNN, AMC and many local channels. 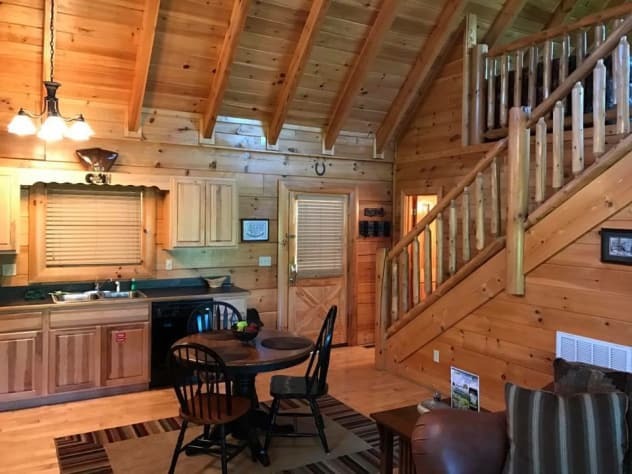 This cabin is also equipped with AT&T high speed internet service which provides fast gaming, streaming, downloading and web surfing. 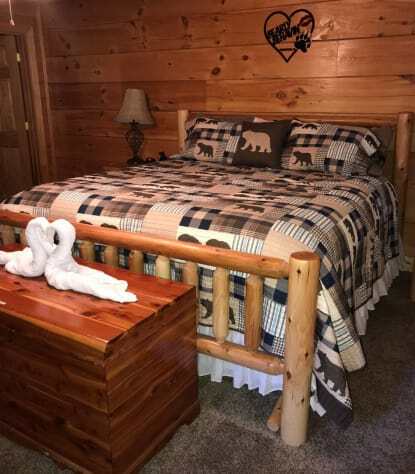 The king size bedroom is located on the main floor and has its own private bathroom with a shower/tub combo, jacuzzi, fireplace, and large flat screen TV. 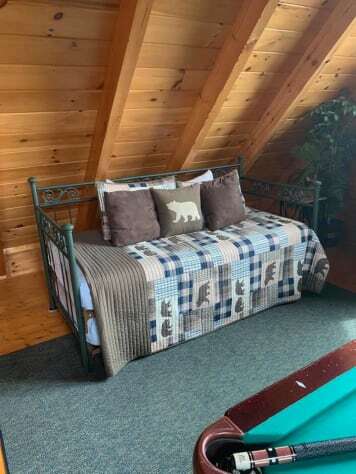 Upstairs you will find a regulation size pool table, arcade game system, A daybed with a pop up trundle which can be used as two Twin Beds or one Queen Bed. A flat screen TV, and a sitting area with table and chairs. 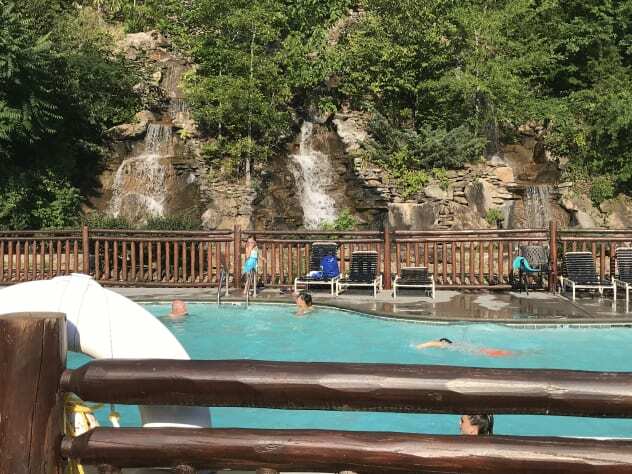 After spending a long day enjoying your favorite activities, the back deck offers a quiet place to unwind, relax in the hot tub, sip on your favorite drink, or just sit in the rocking chairs while watching a beautiful sunset over Bluff Mountain. 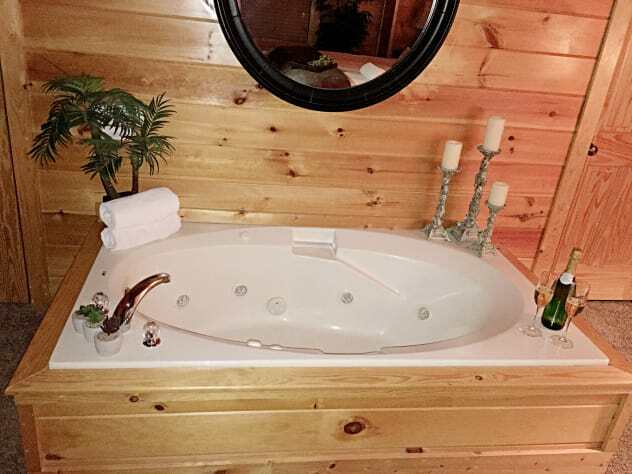 What could be more romantic than snuggling together in a hot tub or bedside jacuzzi, or curling up in front of the fireplace watching a movie? Your time together here will remain with you for years to come and make memories worth repeating so you will want to return year after year. 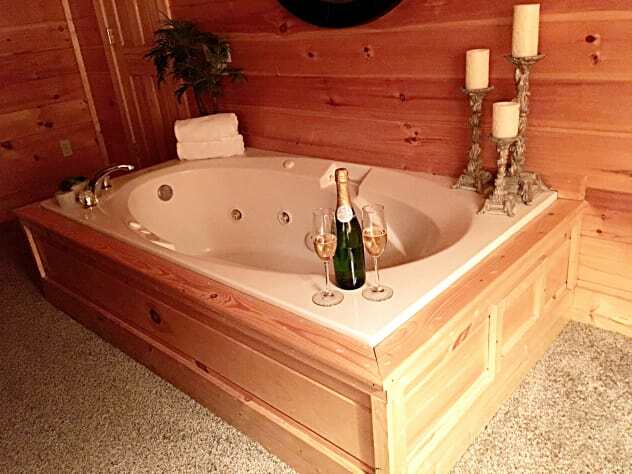 This luxurious cabin is the perfect setting for honeymooners, anniversary celebrations, or any couple's getaway. Don’t miss out --- Book this beautiful retreat TODAY! 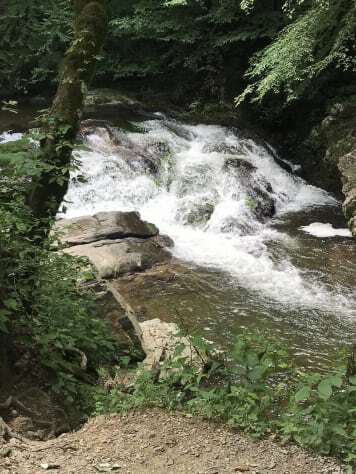 Short distance to Dollywood and Splash Country, Dixie Stampede, Wonder Works, Outlet Shopping, golfing, fishing, River Rage Tubing, Cades Cove, Gatlinburg, Ripley's Aquarium, Smoky Mtn. National Park, horseback riding, swimming, hiking, biking. Fine dining, family dining, dinner shows. 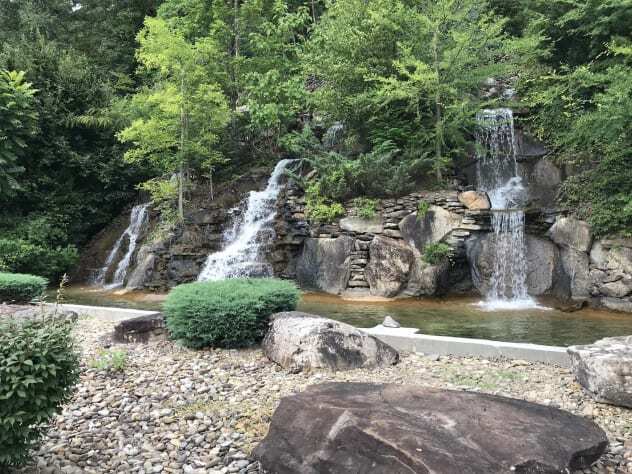 Pigeon Forge attractions and amusements. My new husband and I booked "Bearly Behavin" for our honeymoon following our wedding on 4/20/19. The Cox's (owners) even gifted us a bottle of wine to enjoy during our stay! The cabin's cozy and romantic atmosphere was perfect for our little getaway! 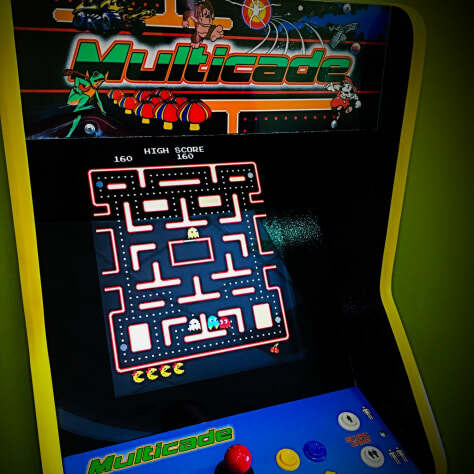 The loft has a pool table, games, and even an arcade game for playful competition, which we loved! Indoor and outdoor jacuzzis were the icing on the cake! We plan to make this our yearly tradition! My boyfriend and I stayed the weekend at the cabin and it was nothing less than beautiful and an amazing stay! I highly recommend staying at the Bearly Behavin’ cabin! It’s definitely worth it! Hi Tatum. Thank you so much for your review. We’re happy to hear that you enjoyed your stay at Bearly Behavin. Please come back and visit again. Thank you so much for your kind words. We are glad you guys had a great time. Come back and visit us again. Absolutely amazing place to stay! Very clean! Close to town. Will definitely be back in the future! My 10 year old son and I just spent two nights in this beautiful cabin. The upstairs loft was a hit with both of us. The game system was great and we enjoyed the pool table too. The kitchen was spacious and well equipped. I look forward to booking this comfortable cabin again. I know my son will be happy when in do! 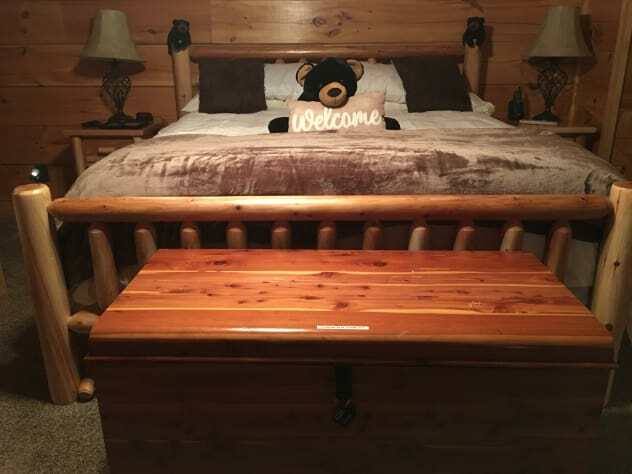 Bearly Behavin is the perfect cabin. Very clean, Conveniently located to all the must do’s in pigeon forge & a short drive to Gatlinburg. The bed & pillows were super comfy! The game area & hot tub were a big hit! The Christmas decor added the perfect touch to get our family into the Christmas spirit! Steve & Christy were such a big help! Looking forward to many more vacations to their cozy cabin! 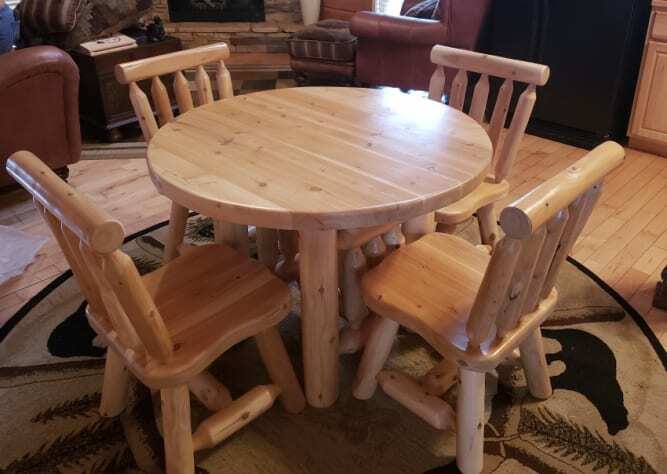 My family and I had a wonderful time at your Bearly Behavin Cabin. 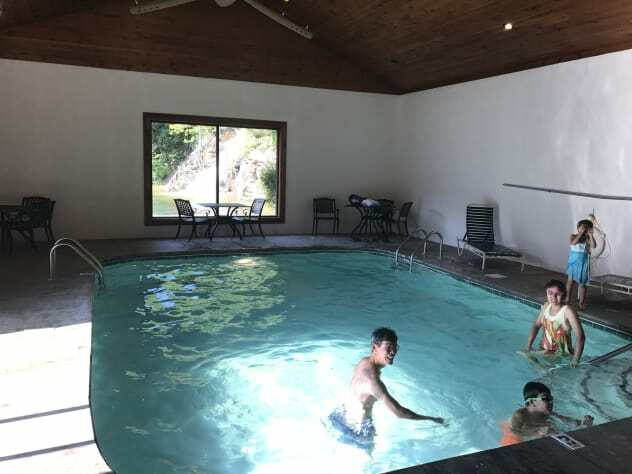 The bed was so comfy and the hot tub and game room was a big hit with the kids. Definitely put us in the Christmas spirit. Cant wait to return again! THANKS AGAIN! Steven and Christy are great to deal with. Questions were answered quickly. Steven even sent a list of things to do in the area. Their cabin is clean, comfortable, nicely decorated, and the location is convenient. I would definitely stay here again!! Hi Gail, Thank you so much for the 5 star rating and for taking the time to leave a review on or cabin. We are so glad you all had a wonderful time. Please come back and visit again. Just got home from a relaxing weekend at this wonderful cabin. 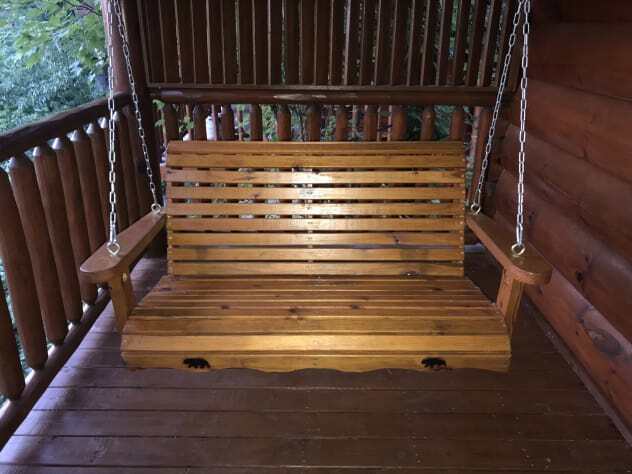 It was very nice, wonderful view, great back porch swing, and a beautiful cabin inside and out. We really enjoyed our stay. Thank you so much for your review and the 5 STARS!! We’re always happy to hear when our guests enjoy their stay. Please come back again! My husband, 9 year old grandson and I stayed in this cabin in July. It was perfect for us. Plenty for our grandson to do, which gave us time to sit on the deck and enjoy the view. It’s a great place to come back to after a busy day site seeing. We’re so glad you all had a great time! Thank you so much for the review. A super get away spot.....! LOL! Thank you so much for the 5 Start rating. We strive very hard to make sure everyone who stays with us enjoy themselves. Come back and visit with us again. We would love to have you! We book this cabin and we are so glad we did! It was just perfect! The view was amazing and the cost was affordable. I promise you, you will not be dissatisfied if he chooses cabin. We absolutely loved our stay! 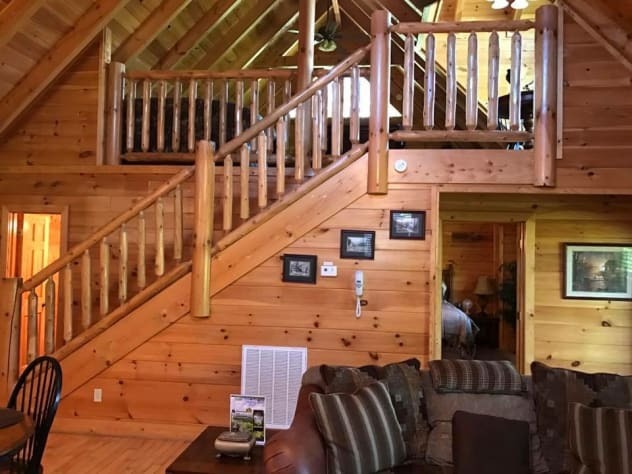 The cabin was beautiful, clean and had everything you could want or need from a vacation rental! We will definitely be coming back and will stay in Bearly Behavin AGAIN!! Thank you for a wonderful time! Thank you for writing the 5 Star review!! We're happy you had a great time and hope you will stay with us on your next trip to PF. We had a great time and the cabin was awesome! 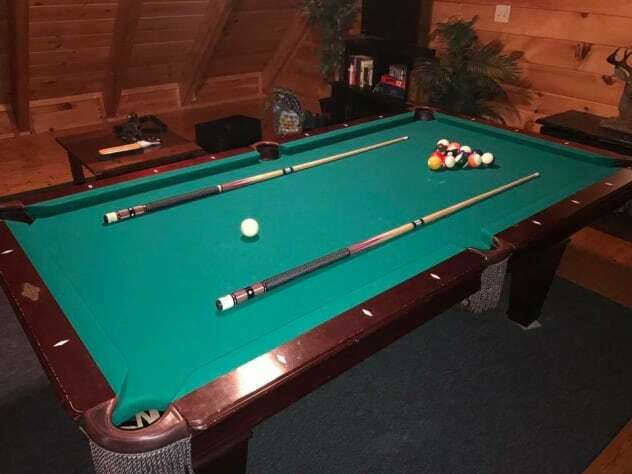 We loved the upstairs with the pool table and the gaming system. We had a hard time getting the kids to leave till definitely1-12 stay at this cabin again! Thank you so much for the 5 star rating and the nice comment. We're so glad you and your family had a great time. Please come back and visit us again anytime. When we the door, it took my breath away. Amazing and Romantic. We absolutely love this cabin. Very clean and cozy. Peaceful and quite. The hospitality and kindness of the owners are remarkable. They went above and beyond to make sure our stay was perfect. You don't find that a lot these days. From here on out this is the only cabin I want to stay at. Thank you so much! It's important to us that our guests enjoy themselves. Return guests is always a good thing. That truly shows they love our home. Enjoy your upcoming stay. Thank you for your kind words. We would certainly appreciate your return visit. Is the kitchen fully stocked? How far is the cabin to area attractions? Downtown Pigeon Forge is only about 3 miles. 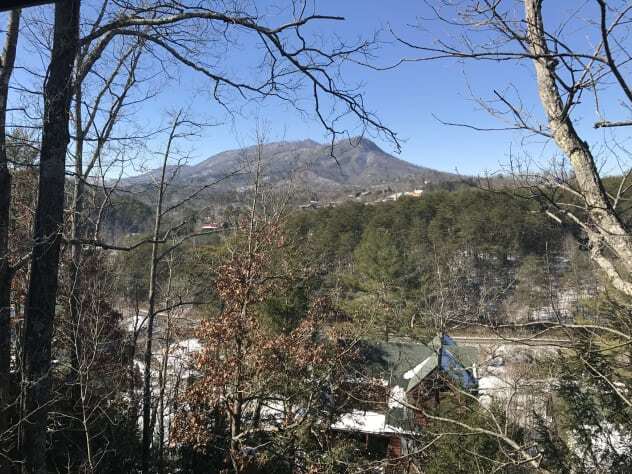 Gatlinburg is approximately 15 minutes away. Both cities offers many attractions for the whole family. Is there a charge to play putt-putt at the resort? Absolutley not! 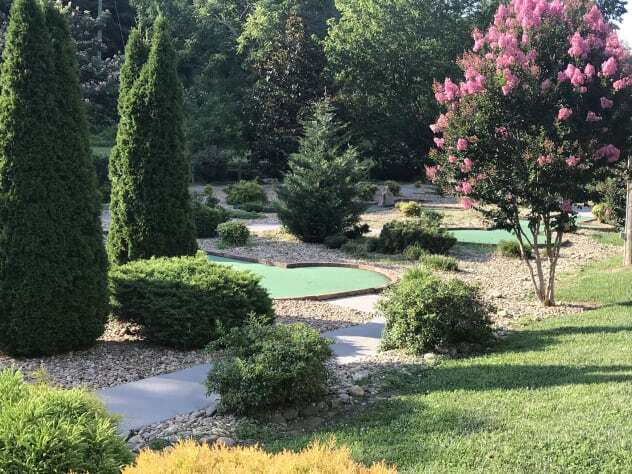 The 9 hole course is free to visitors who stay in the resort. Each cabin owner supplies the putters and balls needed to play.